It's no too bad and frankly I'm amazed at how strong this joint is. Even without any glue it's very difficult to pull apart. Now for the opposite side I need to decide how to layout the tails while taking into consideration the shorter drawer back. I decided to essentially mimic the other side with the only difference being that I'm not going to cut out the bottom half pin. After doing a bit of research online, I think the next time I'll layout the pins first on the drawer back and then cut the tails to match. I'll end up with a half pin partway up the drawer side but I think that'll look okay. 1. hogging out most of the material between the pins on the bandsaw. 2. Instead of putting my chisel right in the marking gauge line and starting there I started 1/16" away from the line, cleaned up the sides etc. and the pared to the line. 1. I've used 3/4" material for all of my drawer parts. 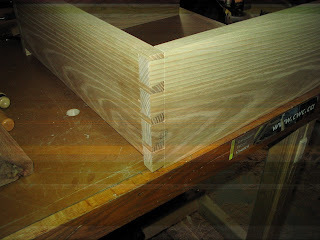 I think that for the next drawers, I'll buy some 5/4 ash and resaw it down to 1/2" thick material. I figure that if there's less depth, there's less magnification of error within the joint. 2. The marking gauge I'm using is a cheap footprint one I bought at Home Depot and it makes a pretty wide line. I've read that a wheel cutting gauge is much more accurate. So I've added a graduated wheel marking gauge to my Lee Valley wish list and hopefully I'll get down to Halifax soon to pick one up. I figured I was getting one for Christmas from my wife but instead she got me a transfer punch set and a japanese chamfer plane. Let this be a lesson to you guys: when sending your wife an email wish list, narrow the list down to the stuff you really need! 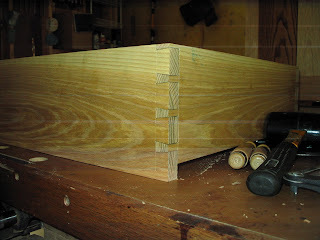 On Sunday afternoon I started the half blind dovetails for the drawer front. This time I started by laying out the pins first and scribing the tails to see if this is any easier. I only got as far as chopping out one end of the pin board and then my wife called. Darn, I'll have to continue later.